DJ Set or Live set, that is the question. Depending on your preference you may or may not have had a good time at Epic Friday night. A live set consists of the trademark Justice stage setup, which is a giant wall of speakers and the white cross, with them playing all Justice tracks or remixes (Check out their new album All Access Areas for a perfect example of a live set). A dj set on the other hand is what we got, which was the duo behind a nondescript table with a couple of laptops and some mixers, playing mostly other peoples music. That's a pretty big difference, although you wouldn't know it from the price of the show. A $50 ticket would not be out of sorts for a live show, although for the size of Epic and this being Mpls, that's still pretty steep. So it was a little disappointing that was the price for this show. According to the promoters, they have to charge enough to pay what the group demands, but if you have to have a Groupon to help sell tickets, it's obviously too much. Just after midnight, following 2 opening DJs (KPT & Soviet Panda), Justice finally took the stage to spin some tunes. In my opinion they did a great job with song selection. They didn't depend on your typical EDM tracks to get the crowd moving. They dropped in some classics, from 'Windowlicker' - Aphex Twin to 'Move Your Feet' - Junior Senior, as well as a few Justice tracks. 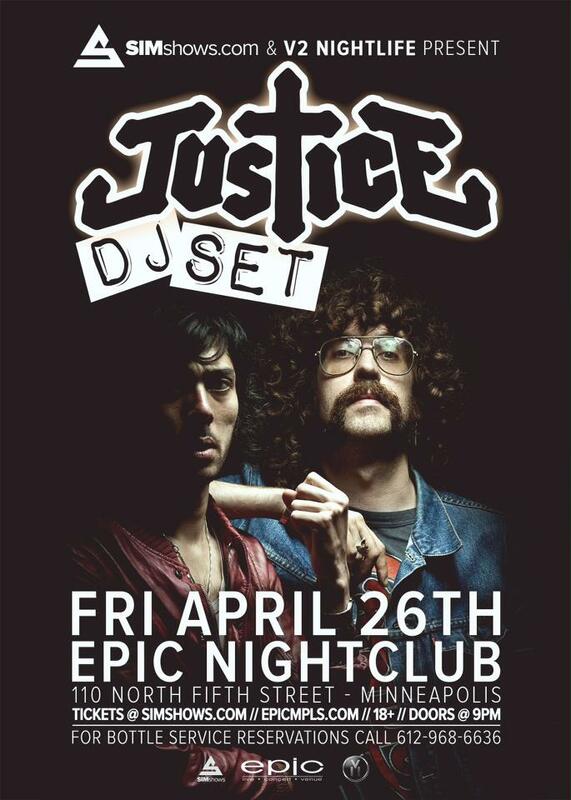 If you were hoping to see Justice perform, you were probably pretty let down, especially after dropping $50. However, if you were there to dance, have a good time, and let Justice curate the music for the evening, you likely had a blast. After all, hearing them mix in D.A.N.C.E. and Civilization is the next best thing to a live set.